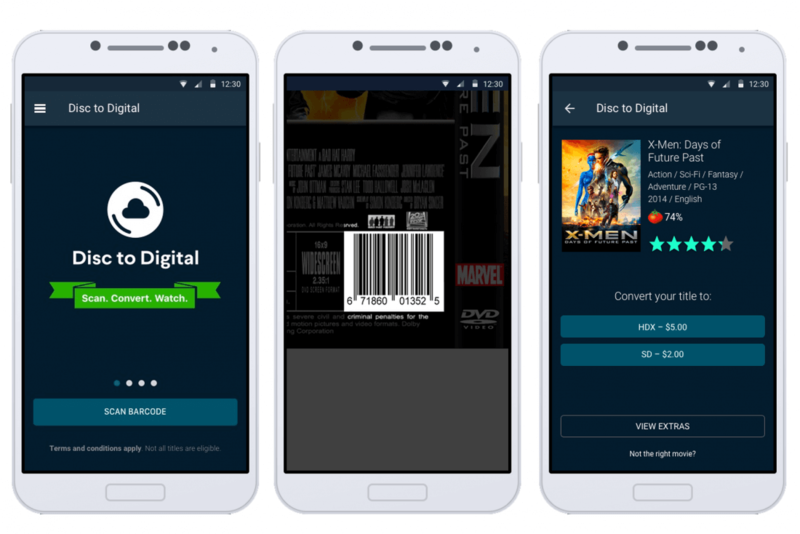 Walmart’ streaming movie service, Vudu, is expanding its disc-to-digital program with an update to its mobile app that will allow users to scan the barcodes the film’s barcode for converting into digital movies you can watch anywhere. The service isn’t free, of course, but for $2 to $5 apiece you can give new life to those DVDs and Blu-ray Discs collecting dust on your shelf. Previously, the disc-to-digital conversion service required people to take their media to Walmart stores, or scan the disc on their PCs using a dedicated desktop software. Pricing remains the same: converting movies you already own is $2 for either a Blu-ray disc to HDX or a DVD to SD, and $5 for DVD to HDX. While the program isn’t free, it's significantly cheaper than re-purchasing your DVD content in digital form, and less challenging and time consuming than ripping them yourself — which is technically still illegal, absurd as it may be. You converted movies will be uploaded to your digital locker on UltraViolet, a cloud-based movie storage service, movies can then be watched on TVs, tablets, smartphones, computers, video game consoles, smart TVs and set-top box devices such as Roku. Keep in mind that Vudu is a closed platform with its own digital rights management system, so any movies you convert into digital format are locked into that ecosystem — you can’t download them or play on unauthorized devices or media solutions such as Plex. The program supports nearly 8,000 films from major studios.